Media rooms and home theater rooms are similar in nature, but serve two very diverse purposes. The main purpose of a home theater room is to watch movies. The home theater room basically has no windows and is usually a very dark room where the lighting control system can be programmed for total darkness serving for the main purpose of this room. The theater seats located in this room are usually fixed, placed in several rows, and give the feeling of a commercial movie theater transformed into your own home theater room. Media room design serves multiple purposes compared to the home theater room. Media rooms usually have a very large video screen and a dominant audio system that serve various useful functions. Some of those functions include: browsing the Internet, watching TV, playing video games, and can be used as the main entertaining area for children or guests. Media rooms usually have more relaxed furnishings and can be converted into living rooms or even made out of the basement rooms. The décor of media room can consist of a table and a couch that resembles the style of the rest of the household’s rooms. 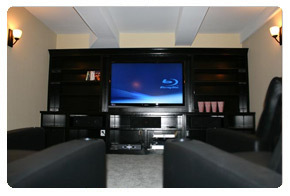 Media rooms have more functions than home movie theater rooms and can be also designed as a custom home theater rooms. They can be also equipped with large wide-screen TV and/or video projector with speakers and a retractable screen. Pravda Inc can help you transform your old living room or other house spaces into media rooms or home theater rooms of your choice! We will custom design your particular room needs with the best video, audio, lighting, sound, and other home automation products to fulfill your every dream!